Bylaws to adopt the proposed Caroline-Clearwater Intermunicipal Development Plan have received first reading and a public hearing on the bylaws and proposed plan is being held on Tuesday May 14, 2019. You are welcome to attend. The Village of Caroline Municipal Development Plan is will be considered for adoption by Village Council in mid-June 2019. A separate public hearing will be held and notices will be sent out in advance. 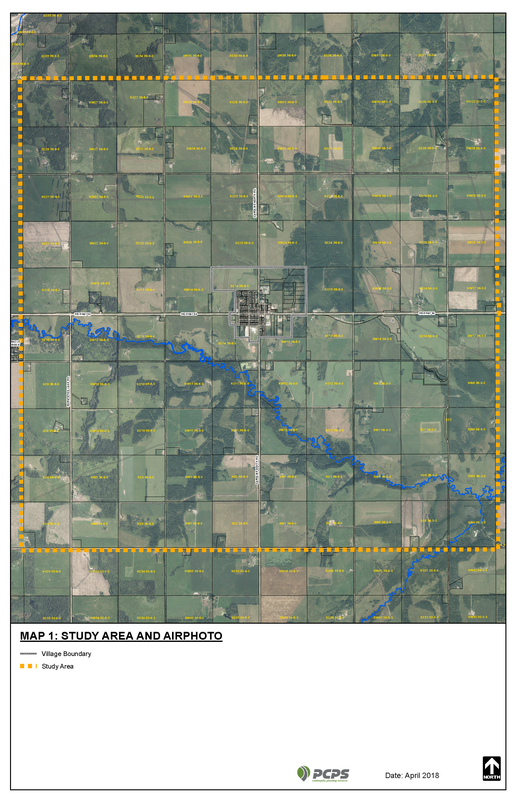 An Intermunicipal Development Plan for the Village and surrounding lands in the County. The area being planned is shown in the attached study area drawing (see image below or click here). Municipal Development Plan (MDP) is the conceptual blueprint for a community. It describes the desired future and the steps that will be taken to get there. An Intermunicipal Development Plan (IDP) is a policy plan agreed upon between two municipalities to coordinate their land use planning, infrastructure planning and service delivery decisions. More information about the role of the two plans is provided below. This page will be updated as the project progresses. Please check back from time to time to see updates and notices about opportunities for your participation. The two plans will help shape the future of the Caroline and Area community. The MDP will describe how the village is expected to grow and change over the next 30 years. This includes new residential areas and new commercial and industrial development. The IDP will describe how the lands around the village will be used over the next several decades. It will also include ways the Village and County can work together to accomplish the desired future for the area. If you are resident of Caroline or a resident of the County, these plans will influence the location of future services, activities and amenities that you may use occasionally or in your day to day routine. Information and materials from earlier steps in the process can be viewed in this section. What is the Overall Process to Create the Plans? The Municipal Development Plan guides and directs future physical growth and development. It seeks to ensure that it is orderly, economical and beneficial while balancing the environmental, social and economic needs and desires of the community. It is visionary, strategic and long-term in its outlook and application. The Municipal Development Plan should reflect the kind of community residents wish to see in the future and identify ways to achieve this future. It provides a policy framework for development and planning decisions far into the future. A thirty (30) year period is the planning or time horizon typically considered. Directions for future growth and expansion. The Intermunicipal Development Plan guides the land use planning decisions of the Village and County to reach a mutually desired future for the area. It seeks to establish a clear understanding of each municipality’s long term planning interests and ways to build upon the positive and mutually beneficial relationship between the County and the Village. The IDP promotes common purpose and fosters certainty for landowners and the municipalities through a clear policy framework and ongoing dialogue. Similar to the MDP, the Intermunicipal Development Plan should reflect the type of community that area residents wish to see develop over the next several years. Future changes in municipal boundaries.